Do you suffer from a persistently dry scalp? If so, you’ll know that the irritation caused by this condition can make your life a misery. Not only will you spend much of the day wanting to scratch your head, but you may also feel self-conscious or embarrassed by white flakes. You might even have a severely dry scalp which can lead to sores, infections and even pain. Luckily, there is a solution – and it’s a natural one, too. Apple cider vinegar is a fantastic way to treat dry scalp, whether it’s caused by eczema, seborrheic dermatitis, psoriasis or any other condition. It can even remove the itchiness caused by head lice. This simple remedy is readily available – you may even have some at home already. Best of all, it’s inexpensive, so you needn’t break the bank when treating a dry scalp. In this article, we’re going to take a look at some of the key causes of a dry scalp and how apple cider vinegar can help. We’ll also provide a number of treatment options and ways you can use this solution to get the best possible results. Why Use Apple Cider Vinegar for Dry Scalp? Seborrheic dermatitis – this relatively common skin condition can cause itching, redness, and flaking, not just on the scalp, but all over the body. It’s commonly known as dandruff when it affects the scalp. Many over-the-counter products are available to treat this condition, but severe cases may require stronger treatment. Eczema – it’s most common among babies and children, but adults can be affected too. The specific cause of eczema is still unknown, and symptoms of eczema include an itchy, flaky scalp. Psoriasis – this happens when the immune system triggers too many skin cells to grow in certain areas. Many people initially think their scalp psoriasis is dandruff, but the two are quite different. Tinea capitis – also known as ringworm of the scalp, this fungal infection can cause a dry, itchy scalp, and if not treated, it can lead to painful blisters, inflamed patches, and even hair loss. A dry scalp can also be triggered by environmental factors. Perhaps the weather has been particularly cold, and it’s caused the skin on your head to dry out. Regular exposure to drying air conditioning systems and the use of hair dryers can exacerbate the dryness. And, of course, hair colorings, genetics, and age also play a part in how each person is affected. So why do so many people turn to this natural solution for treating a dry scalp? Firstly, many people are tired of using so many chemicals on their hair. Over-the-counter treatment options, regular haircare products, and other medications can sometimes make the problem worse. Lots of people would prefer to try a more natural route. Apple cider vinegar is a natural cleanser, rich in malic acid, which is known to kill viruses and prevent the growth of yeast. It also has powerful antiseptic properties which help to kill bacteria and fungus, preventing infections and inflammation. The cleansing nature of this liquid also helps to get rid of any build-up or residue on the scalp, leftover from hair treatments or other haircare products. If your dry scalp is caused by some form of fungus or yeast, apple cider vinegar can help by rebalancing the pH level of your scalp. Fungus and yeast tend to prefer alkaline environments, and the slightly acidic nature of apple cider vinegar can help create inhospitable conditions for fungus to grow. One of the most important acids in apple cider vinegar is acetic acid, which is packed with nutrients and vitamins. These include vitamin B1, B6, A and C, as well as iron and potassium. All of these are essential for a healthy scalp and healthy hair in general. Hydroxyl acids are also present in apple cider vinegar. These acids help to exfoliate the skin and open up the follicles, which can help nutrients and vitamins get right into the roots of your hair. Exfoliating the scalp is just as important as exfoliating the skin on the face. It helps to prevent clogged pores, which can lead to itchiness and flaky skin. So as you can see, there are lots of different reasons why people use apple cider vinegar as a dry scalp treatment. It has so many benefits for the hair and scalp, and it can keep the entire area healthy and nourished without excessive chemicals or artificial ingredients. If you’d like to try using apple cider vinegar on your scalp, there are a number of ways you can do so. This will provide relief for your irritated scalp, and also set you on the path towards recovery. There are hundreds of different recipes and treatment methods online for using apple cider vinegar, but we’ve done all the hard work for you. Here are some of the most widely used methods, with a step-by-step guide for each one. This comprehensive method might take a little time to complete, but it will give your scalp plenty of time to soak up the apple cider vinegar. Plus, you only need to complete this process once each week. Before you start, mix equal parts apple cider vinegar and lukewarm water. If you’re worried about using too much vinegar, or if you have sensitive skin, feel free to add a little more water to the mix. Wash your hair with shampoo as you usually would, but don’t use any conditioner on your hair. Take a cotton ball and apply the diluted apple cider vinegar directly to the scalp while the hair is still wet. This may take a while, but it’s important to reach as much of the scalp as possible. Ask a friend, partner or family member to help out if you can’t reach all of your scalp. Leave the vinegar solution on for between fifteen and thirty minutes. During this time, you can wrap it in a shower cap or a plastic bag to ensure it doesn’t drip or get on your clothes. When the time is up, wash your hair again as usual, with shampoo only. Repeat this process once every week until you notice that your dry scalp has subsided completely. This technique is much faster than the first option and is ideal if you use a lot of hair products on a day-to-day basis. If you like to apple products like gel, serum, dry shampoo or hairspray, this technique will help prevent the build-up and keep your hair fresh and clean, as well as working wonders on your scalp. Mix two tablespoons of apple cider vinegar and two tablespoons of water. Shampoo your hair as normal (we recommend using a natural shampoo, such as Christina Moss Naturals Shampoo). After you’ve rinsed the shampoo away, pour the solution directly onto your scalp and massage it into your scalp and all the way down the shaft of your hair. Focus mainly on the scalp, but if you use heavy products like mousse or serum, make sure you pay attention to the hair too. Leave on for around five minutes, then rinse off completely. You can repeat this process as many times as you like during the week. This method allows you to soak up all the benefits of apple cider vinegar, as well as the nourishment provided by avocado and coconut oil. Create a solution with equal parts apple cider vinegar and water. At this point, you should also make your avocado and coconut oil treatment. Mash one avocado and add two tablespoons of coconut oil to the mix. Combine well. Pour the vinegar and water mix into a spray bottle and spray all over the hair and scalp. Leave to soak for around ten minutes, before rinsing with Christina Moss Naturals Organic Shampoo. After rinsing the shampoo, apply the avocado and coconut oil mix to wet hair. Rub it into the scalp and all the way down the shaft of the hair. Cover the hair with a shower cap or plastic bag, then leave for up to thirty minutes. Rinse off the avocado and coconut oil mix with a mild shampoo – tea tree oil shampoo is a great natural option. Repeat once per week to keep your scalp hydrated and free from fungus and bacteria. Before you use any apple cider vinegar at all, apply some to a cotton ball and dab it on your wrist or on the skin around your hairline, to check you’re not allergic to it. If you have open sores or lesions on the scalp, do not use apple cider vinegar – it will be very painful. Use a shampoo brush to work the apple cider vinegar (or the avocado and coconut mix) through the hair and across the scalp. Don’t let a dry scalp cause you misery any longer. 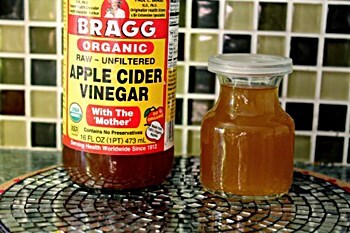 Apple cider vinegar is inexpensive. It’s an easily accessible ingredient which can help treat the dryness and irritation, restoring your scalp to its former healthy and glory. Stock up on this fantastic natural ingredient today, and be sure to try out the treatment methods we’ve listed here for the very best results.